Have you ever wanted to be an artist or paint something beautiful but felt you didn't know where to start, or just thought you had no artistic talent at all? Heard of fluid art and wondered what the craze is all about? Want to do something creative with your friends to relax and unwind after the work day? If you answered 'yes' to any of these questions, you will LOVE this introductory fluid art class! WHERE: Join us at Peace House Art Studio, located at 6030 St. Andrews Road, Suite D, Columbia, SC 29212 and explore your creative side while learning different fluid art techniques that you can try at home. 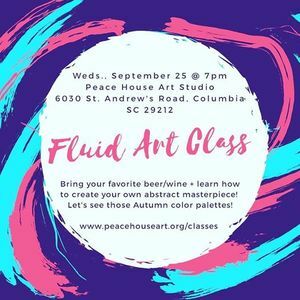 Bring your favorite wine or beer and laugh the class away as you learn more about color theory and composition and take home your own beautiful, unique fluid art creations. Leave all expectations and anxiety at the door as our experienced teacher guides you through the process and answers all your questions along the way. 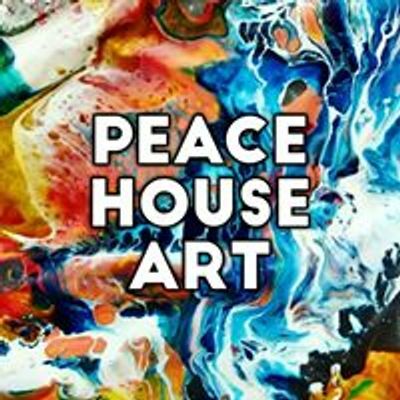 SPECIFICS: You will be creating one painting (11" x 14" canvas and an optional 12" vinyl record base for an additional $20) and learning at least three techniques. Paintings will receive two layers of gloss varnish for no additional cost, protecting them from the elements and giving a glossy shine. For $20 extra, your painting will be given a topcoat of epoxy resin, which will create a smooth, sturdy, glass-like protective layer that makes the colors come alive and adds dimension. Examples of this will be given in class. SUPPLIES INCLUDED IN THE PRICE: Your substrates (canvas/record), all paint, pouring medium, gloves, cups, tools (mixing sticks, etc. ), a painter's apron, and a supply list for future experiments at home! Complimentary coffee and tea will also be available. ***NOTE*** One of the products we use in class is latex-based, so if you have a latex allergy, PLEASE let us know in advance so that we can make sure to have a non-latex product available to you! WHAT IS NOT INCLUDED: Epoxy resin topcoat (see above), clothes to paint in*, any alcoholic drinks you wish to provide (please note, you will be asked to sign a waiver if you choose to consume alcohol on the premises). *It is recommended that you bring a change of clothing that you don't mind getting paint on. Although we do provide aprons, it's better to be safe than sorry, because fluid art can get splashy! We do have some oversize t-shirts on hand if you forget! If you are sensitive at all to acrylic paint and mediums, we will have painters masks available as needed.